We love living in a healthy environment and want to keep that way for generations to come. We are experts in water conservation and using our precious water resources the best ways possible. Installing rainwater tanks to catch run-off from your property’s roofs and other hardscapes is a great way to reduce the demand of pumping fresh water in to irrigate the landscape. These systems are sized from 55 gallons – 50,000 gallons and beyond, all sized according to the site demands. Round and Slim Lined tanks from the hundreds to the thousands of gallons. We can always create a vine trellis to surround the rain tanks for a natural, flowering cover. You can view Bushman's specs for this tank here. Slimline Rain Tanks come in several sizes and fit great in tighter spaces to optimize catching potential. 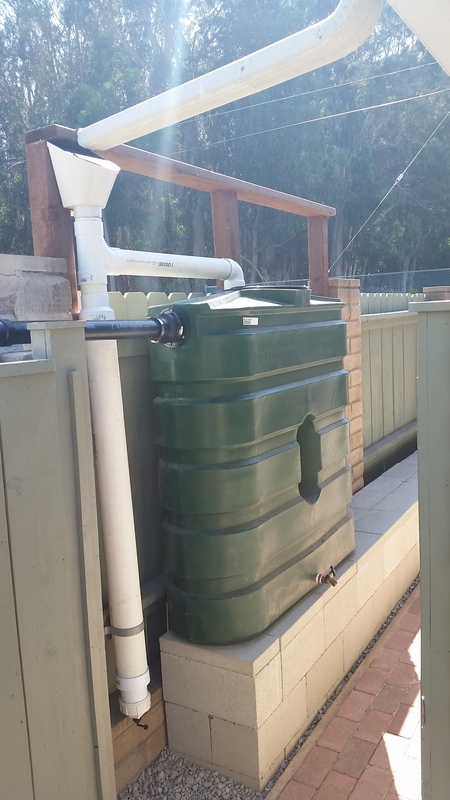 We can install a pump with your tanks to allow for automatic drip irrigation use or for a hose bib so you may use your free, caught water whenever you wish in your garden.